With a Samba Preclin transducer, intravascular blood pressure (IBP) and left ventricular pressure (LVP) monitoring become more straightforward than ever. Inserted through the carotid or fermoral artery you can receive accurate, high resolution data. The small size allows you to insert the sensor directly into the brain tissue or in the brain ventricles and measure very rapid trauma events. The extremely fast sampling rate and sensitivity enable you to see pressure patterns never observed before. Samba Preclin offers exciting opportunities when using MRI-scanners. The sensor gives you total freedom to monitor pressure while simultaneously capturing images in the latest high-end scanners. Gating also becomes more reliable and robust with the Samba Preclin transducer. For Example, if placed in the tail artery of a rat, both IBP and respiratory signals can be captured using a single sensor. The primary feature is the miniature size: 0.36 or 0.42 mm depending on version. The transducer can be applied into a tiny organ or tissue and smoothly inserted without causing unnecessary harm. Once in place, the transducer will not affect the actual environment it is set to measure. The Samba Preclin transducer is also safe, meaning that no electricity and no bio-hazardous materials are involved. It is also insensitive to any form of electro-magnetic fields to make it fully compatible with high-end imaging technologies such as MR, CT, PET and SPECT. If scanner triggering is desired the blood pressure signal can be used in favour of ECG to further increase image quality. * Please Note that the Samba Preclin transducers are for animal research studies only and are not approved for human use. 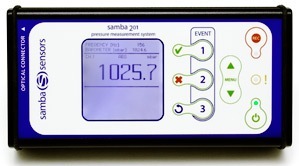 The Samba Preclin pressure transducers are comprised of a silicon sensor element mounted on an optical fibre. Each transducer is calibrated at the factory before delivery to eliminate the need for customer calibration. The calibration data is stored on a small EPROM positioned on the connector and is read automatically at start up.